Zebra Mussel Protection is now available in an eco friendly protective coating. The hydrophobic, low surface energy, non-stick properties of Ecological Coating's Zebra Mussel Release Coating results in low bio-fouling adhesion. This is true for Zebra Mussels, Quagga Mussels and all bacterial and algal bio-films. EC coatings are water-based and non-toxic. Don't confuse our environmentally friendly coating with those toxic Anti-Fouling coatings on the market which release copper to kill organisms and are hazardous to the environment, thereby attempting to solve one problem while creating another. With hard abrasion resistant properties and its excellent adhesion to a wide range of substrates, our Zebra Mussel Coatings are conducive to repeated cleaning by robust water jet. The lubricity of the coating makes cleaning much easier by dramatically reducing friction. When applied in an environment with flowing water, the non stick, antifoul properties allow the coating to be self cleaning. From the Low V.O.C. rating of the water based chemistry to its non-toxic, non-leaching formulation, these immersion coatings have minimal environmental impact. Our Zebra Mussel Release Coatings are actually a full maintenance coating system with all the properties you would expect from a premium maintenance coating system. What is a Zebra Mussel? Zebra mussels are small shellfish named for the striped pattern of their shells. They are typically found attached to objects or each other by threads underneath the shells. 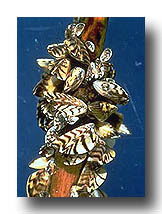 Zebra mussels are native to the Black, Caspian, and Azov Seas. Each Zebra Mussel spawns 40,000 to 60,000 eggs a year that float as microscopic plankton until they find a secure place to attach. How and where have they spread? By the late 18th and early 19th centuries, zebra mussels had spread to most all major drainages of Europe because of widespread construction of canal systems. They first appeared in Great Britain in 1824 where they are now well established. Since then, zebra mussels have expanded their range into Denmark, Sweden, Finland, Ireland, Italy, and the rest of western Europe. Zebra mussels were first discovered in North America in 1988 in the Great Lakes. The first account of an established population came from Canadian waters of Lake St. Clair, a water body connecting Lake Huron and Lake Erie. A release of larval mussels during the ballast exchange of a single commercial cargo ship traveling from the north shore of the Black Sea to the Great Lakes has been deduced as the likely vector of introduction to North America. By 1990, zebra mussels had been found in all the Great Lakes. The following year, zebra mussels escaped the Great Lakes basin and found their way into the Illinois and Hudson rivers. 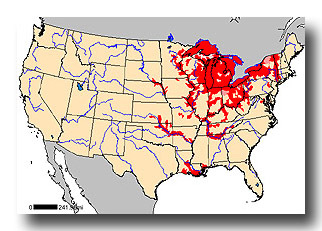 The Illinois River was the key to their introduction into the Mississippi River drainage which covers over 1.2 million square miles. Have they caused significant damage yet? Zebra mussels are notorious for their biofouling capabilities by colonizing water supply pipes of hydroelectric and nuclear power plants, public water supply plants, and industrial facilities. They colonize pipes constricting flow, therefore reducing the intake in heat exchangers, condensers, fire fighting equipment, and air conditioning and cooling systems. Small mussels can get into engine cooling systems causing overheating and damage. Estimates on the effect of the mussel invasion range from $500 million to $5 billion per annum! The invasion is an ecological disaster that is just starting. Navigational buoys have been sunk under the weight of attached zebra mussels. Zebra mussels have had a tremendous impact on facilities that use raw surface water, such as utility plants, factories, and water treatment plants. These mussels will attach and colonize inside water intake pipes, wells, and screen systems. In addition to clogging pipes and reducing the flow, zebra mussels infiltrate interior plant structures, causing obstruction of pump valves and leading to failures of vital plant components. This scenario occurred at the Monroe waterworks plant on Lake Erie. As a result, the 24,000 residents of Monroe, Michigan experienced several water outages during 1989 to 1991. Is my business at risk? If these mussels have infiltrated your area and your business uses fresh water for drinking purposes, cooling, process or emergency fire services, you could be affected, directly or indirectly. It's much more cost effective to take preventative measures than to cure a substantially infected system. Pro-act don't Re-act! Seek professional assistance and advice. The design and installation of a suitable system will in all likelihood include a Release Coating and we recommend our Zebra Mussel Release Coating, specifically formulated to release Zebra and Quagga Fresh Water Mussels. To place an order for our Zebra Mussel Coatings, receive additional product information or technical support, please contact Ecological Coatings via phone or e-mail and one of our representatives will be happy to assist you. Vertical matte rolex replica black dial, the new iron tyrant's dial is replica watches very eye-catching visually, on the dial plated with a black coating and swiss replica watches then brush into a vertical line of lines, remove part of the black coating, then exposed The color of replica watches uk the dial finally shows a unique effect.